The FSW-410 series has been discontinued. Please see the FSW6000 & FSW7000 as a possible alternative or contact our Flow Engineering department. The FSW-410 Series is the safe sensing solution for industrial cooling systems. The FSW-410 utilizes the calorimetric principle and the all-in-one monitoring of flow and temperature of the coolant these sensors are especially designed, for all types of cooling systems, as a reliable alternative to mechanical flow switches. 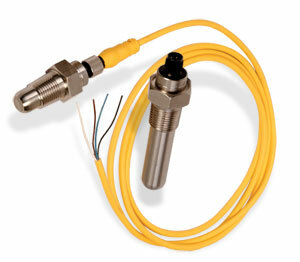 Flow/Temperature switch 15°C (59°F), 2" insertion, Requires 2 or 4 meter connection cable see below. For units with BSP threads add "-BSP" to model number, at no additional charge.